Looking for a delicious chocolate fudge recipe with the texture and flavor of old-fashioned fudge, but the speed and convenience of modern fudge? Look no further! Stovetop Fudge is an easy fudge recipe that comes together in under 10 minutes and doesn’t require extended beating or any special equipment. It's smooth, slightly chewy, with a rich chocolate flavor and a luscious, melt-in-your-mouth texture. We have a wide variety of other fudge recipes to explore, as well. If you're looking for quick and easy, Microwave Fudge is one of the most popular recipes on the site and it comes together in just a few minutes. 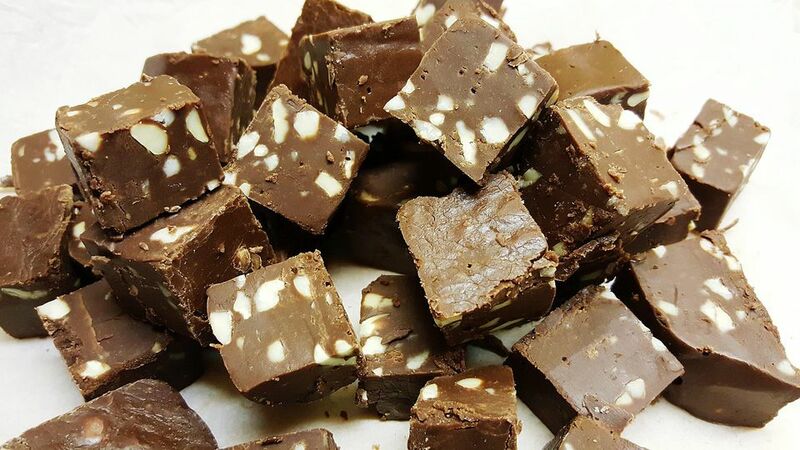 For a more traditional fudge recipe, try Old-Fashioned Chocolate Nut Fudge - this one is just like Grandma used to make! There's also a wide variety of flavored fudges available, including Cherry Chip Fudge, Cookies and Cream Fudge, and German Chocolate Fudge. Prepare an 8x8-inch pan by lining it with aluminum foil and spraying the foil with nonstick cooking spray. Combine the cream and corn syrup in a medium saucepan over medium heat. Stir while the mixture heats, then bring the mixture to a boil and boil it continuously for one minute. After one minute of boiling, remove the pan from the heat and stir in the chocolate chips or chopped chocolate, stirring constantly until the chocolate is melted and the mixture is smooth. Add the powdered sugar and stir until the mixture is smooth and the sugar is incorporated. Finally, add the vanilla extract and the toasted chopped walnuts, and stir until the walnuts are distributed throughout the fudge. Pour the fudge into the prepared pan and smooth it into an even layer. Refrigerate the fudge until it is firm, for about 2 hours. Once the fudge is set, remove the fudge from the pan using the foil as handles. Use a large sharp chef's knife to cut the fudge into small squares. For the best taste and texture, serve this fudge at room temperature. Stovetop Fudge can be stored in an airtight container at room temperature for up to a week. Variations: Consider adding other mix-ins to the fudge, like different types of nuts, dried fruit, or shredded coconut. You can even get creative and add other candies, or chopped-up cookie pieces!